Georges Bardawil (6-1) is the latest signing made by Brave Combat Federation leading to the eleventh edition of the event in Brazil. Considered as one of the best bantamweights in the Arab world, Bardawil captured championships of Cedar FC and Evolution Championship simultaneously to hold belts in two different promotions at the same time. Currently training at Tristar Lebanon, for his upcoming bout in Brazil against Carlos” Carlin ” Soares, who has eight victories in his nine appearances, Bardawil has set his eyes directly at the championship at the Brave Combat Federation. At Brave 11, Bardwil and Ahmed Amir from Egypt will be representing the Arab nations in Brazil. A 2 division champion, Bardawil aims to proves he is the best in the emerging bantamweight division in the Middle East by making a statement at Brave Combat Federation. There are many good fighters in the Middle East and everyone is working on their skills to keep moving forward. I wish them all the luck and success, but every time I step into the cage with one of them, it seems like a easy fight and I already did that in three different promotions. I am waiting to prove that I am the best in the largest promotion in the Middle East. When asked about Middle Eastern fighters, Bardawil is confident enough that the region’s fighters are as skilled as any international fighter, and day by day, Arab fighters are shining on international stages and debunking the wrong perceptions. Fighters in the Middle East are as skilled as fighters from rest of the region. There is a lack of knowledge and sheer ignorance among top media and people who appear to represent the sport. We are hungry to fight and we love to prove to the world how great we are. Still, fighters from the Middle East are always underestimated. At the moment we are proving them wrong. Signing with one of the best promotions currently out there, Brave Combat Federation, Bardawil will get the chance to show the world what he’s made of, and that he is capable of overtaking global competition. 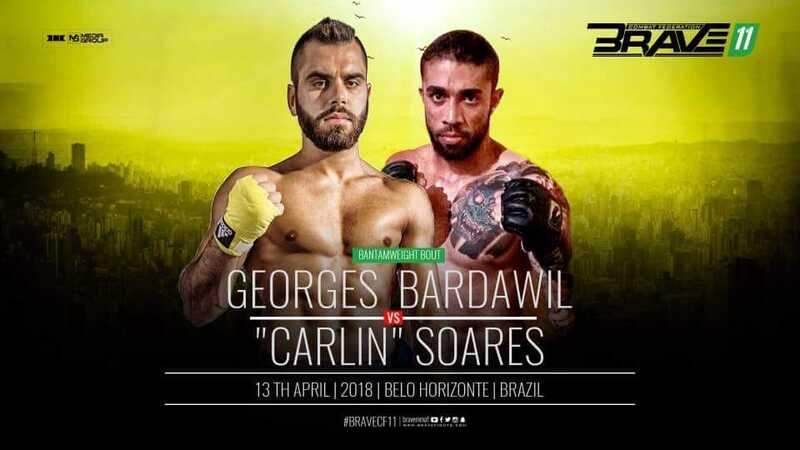 Contrary to most of the Middle Eastern fighters who fought in the safety of their comfort zones in front of their friends and fans, Bardawil will head all the way to the land of martial arts, Brazil, and face an opponent in his hometown. Bardawil will be the only Lebanese to fight on the Brazil fight card. This will take the fight to a whole new level where I set to an unknown land knocking down the gates to challenge their hero. When I step inside the cage, the whole town will be against me, wishing me to fall. And when I leave the cage I will win more than a fight. I will hold my head high conquering the respect and love of a city of people who love martial arts. I had already did that in many countries. There are many who are performing at a high level, but I will showcase a skillset to prove that I am on an another level, just mark my words. Lebanon will make a statement in the bantamweight division like never before. Good Luck, for my opponent and I cannot wait for the moment when the cage doors are shut and to dance together in the cage. On his future plans at Brave Combat Federation, Bardawil has his eyes set on the championship, and seems committed to take this sport to a whole new level by representing his nation and inspiring young athletes. I am training everyday for this fight. Definitely, my eyes are on the championship. I aim to be an ambassador of Mixed Martial Arts for my nation and for the region at large. Indeed there is immense growth and popularity for the sport in the region. I aim to inspire the youth in the region and to become champion who reciprocate values of courage, ambition, determination and simplicity that will make me a true representative of the sport of mixed martial arts. I am set to dominate the Bantamweight division and show every fighter that I deserve the championship and have earned my dominance while I raise the Lebanese flag high all around the world.